Create a rainbow effect by displaying colorful jelly beans in the Twelve Drawer Compact Plexi Display. 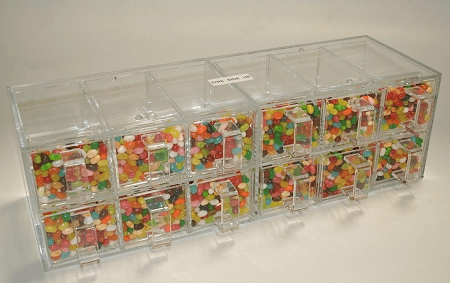 Stacking mini bins will not only save space but give you more options to display your colorful candies. Mix and match up to twelve flavors of delectable delights to create a unique profit-making when you fill up these twelve drawers. 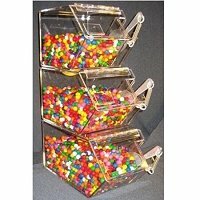 Plastic candy dispensers allow you to individually display an assortment of candies from chocolates to taffy. Plastic containers are also useful to display small cosmetics or small novelty items. No matter what you fill them up with you can be sure customers will notice. Purchase today!